A must-read for every Namibian invested in their personal development, Follow Her Lead is Leading Edge’s latest contribution to ensuring a more gender equal Namibia, that recognizes the talent and contributions of women leaders who are making our country a better place. The book – whose foreword is written by Africa's foremost female entrepreneur, Bethlehem Tilahun Alemu – sets out the context for women's leadership in Namibia based on extensive research, features a list of Namibian Female Firsts, and provides inspiring lessons from 20 Namibian women who were nominated by the Namibian public, and selected by an external panel of judges to feature in the book. 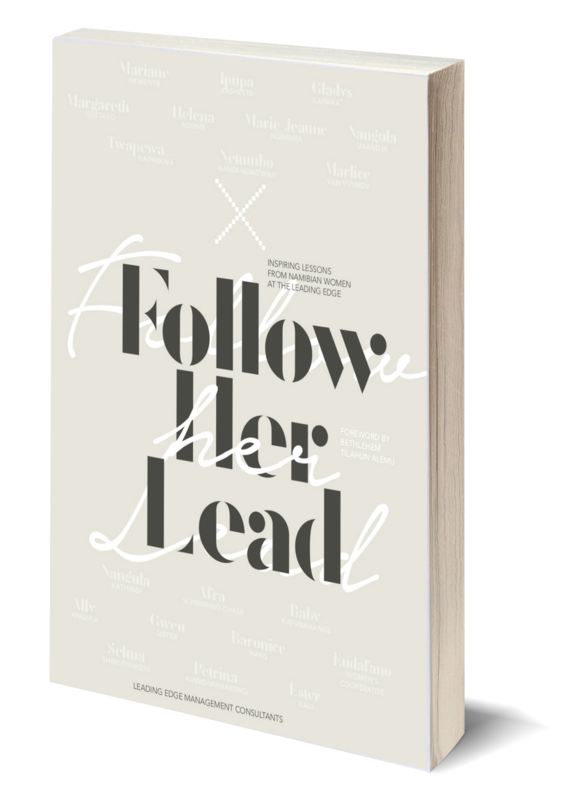 These lessons are based on their experiences both as leaders, in general, and as female leaders in particular; and provides important insights for both men and women who are keen to create a Namibia whose diversity is clear in its leadership. Follow Her Lead: Inspiring Lessons from Namibian Women at the Leading Edge presents all those who read it with an opportunity to be inspired, to learn, and to appreciate the immense talent on offer in Namibia. :: ORDER YOUR COPY NOW!